W12766 S River Road Blair, WI. 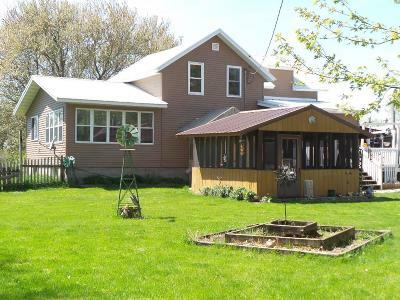 | MLS# 1529000 | Clearview Realty in Hatfield Wisconsin. Helping Hunters, Families, and ATV'ers list or buy property for 15 years. Serving both Wisconsin & Minnesota. Just 1/2 mile from the Blair/Taylor school is this 5BD, 1.5BA hobby farm on 13.40 acres with creek frontage. Home was raised in 2001 and new basement constructed; kitchen floor was also replaced & bedroom and sunroom added. Fenced yard with screened gazebo; water hydrants in different sections of the property for gardens or animals. Chicken coop, apple trees, raspberries, grapes, blueberry & plenty of vegetable gardens. At-grade septic installed in 1999 & new metal roof on the home in 2014. 2BD single wide guest house placed in 2008 and shares well and septic with the main house. Pole building/workshop with electric built in 2010. Directions: In Blair, E. Broadway Through Town, Turns Into River Road; Home On Left.